Painting in the open air — en plein air — was a pretty radical concept when it was first practiced in 19th-century France. The Impressionists and their predecessors of the Barbizon School trudged out of their studios and into the countryside to capture the environment’s ever-changing light by seeing it firsthand. That practice has become a tradition for contemporary realist painters, especially in beautiful locales such as Vermont. At the Bryan Memorial Gallery in Jeffersonville an exhibition of more than 100 paintings by 60 contemporary landscapists, who created works in honor of the 50th anniversary of the Nature Conservancy, is on view through October. The national juried exhibition “Inspired by Nature” consists exclusively of works made on Nature Conservancy preserves in the Green Mountain State. It’s a diverse show, ranging from the arch-traditional “Coming Storm” by Ian Marion to more abstract pieces, such as Annemie Curlin’s map-influenced paintings and expressionistic works by Jayne Shoup and Dorothy Martinez. At 70 by 54 inches, Marion’s “Coming Storm” is one of the largest pieces in the show, and it’s also the most classical. His technique is similar to that of American painter Thomas Cole (1801-1848), with slightly stylized leaves, dramatic values and an exquisite composition that pushes the focal point slightly-off center. Though nearly as large, the 50-by-46-inch “St. Albans Bay OB #2, St. Albans VT” by Tinka Martell is stylistically the opposite. Her piece is an extremely simple composition with a complex surface: Grit was added to the brown along the lower edge, and a smooth indigo, indicating water, looms in the top two thirds of the work. Shoup’s “Barr Hill View/Caspian Lake” is an 18-by-24-inch pastel portraying the lake with the utmost simplicity, rendered in just four main hues. Sky and lake are a silvery gray, foreground pines are deep green, surrounding hills are crimson, and distant mountains are purple and lavender. “Top of the Trail, Barr Hill, Greensboro” by Martinez is a fine little 12-by-16-inch oil, apparently done in the same vicinity. 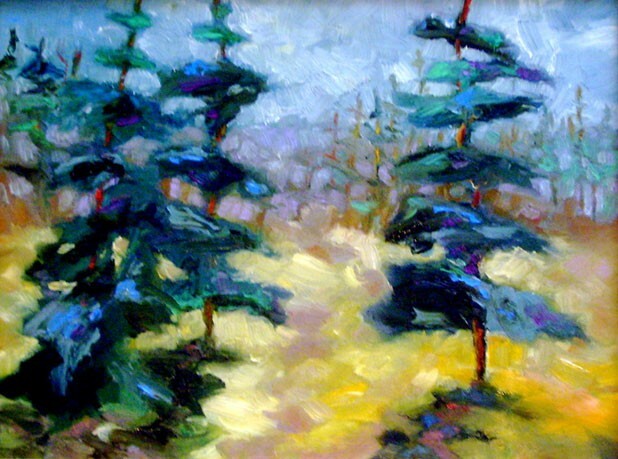 Three pine trees in the foreground and a stand of them in the background are made with juicy green and blue brushstrokes. Choppier strokes compose the sky and meadow. Martinez’s “Colchester Pond, Colchester” is dominated by cerulean blue in the foreground water, sky and light captured on the conifers. “Black Mountain Ferns Out My Back Door” by Petria Mitchell, another small oil, depicts a misty gray atmosphere, pale green leaves and ferns. Tree trunks are nearly black, as if soaked by rain. Curlin’s mixed-media paintings are the most abstract works in the show. The images’ point of view is that of a passing airplane, with roads and fields segmenting the ground. She also uses colors similar to those found on maps. “Williams Wood, Addison” is a 24-by-17-inch piece that includes a passage of Lake Champlain shoreline. The craggy, raw-sienna shore contrasts with water whose blue ranges from dark values at its depths to lighter blue in the shallows. “Dead Creek” is a vertically oriented construction. Six of its panels open to show other items from the landscape. At center right is a realist farmscape; beside it at left is a woven collage of words and photographs. The 19th-century French painters who were inspired by nature were also inspired by new technologies. Tube colors became available in the 1820s, and the French Box Easel, developed at midcentury, made outdoor painting easier than ever before. Things haven’t changed much for plein air painters since then, but most parts of the landscape certainly have. Thanks to the Nature Conservancy, places to create beautiful paintings remain.